The lens part was so small that it was difficult to focus and it did not become usable. It is quicker to check with a loupe as usual. Loupe part is too small to be seen. I would like you to make a big improvement a bit. I am very satisfied with the design · price, but I think that it was better if the loupe part is a little broader. Ideal for fish glasses in dim light times and cloudy weather. The presbyopic lens part is small and it is low, just by raising the eyeglasses slightly lift only when looking at the hand. Rather it does not hinder usual visibility and it is convenient for me. Even if the price doubles, I want to buy another one if the color of polarized light comes out. Used when working fine at hand, such as a ruther. It is convenient to see details and parts of parts with magnifying glass while protecting eyes. It may be even easier to use as the amount of movement of the eyes decreases if the magnifying glass is made a little bigger. The loupe is useful to see small letters such as instructions during work. Safety glasses were mainly used, so there was no discomfort in the size / position of the magnifier. In the air conditioner washing work, the eyes can be protected, and it is very convenient because you can work without changing the eyeglasses as it becomes a shadow and difficult to see. 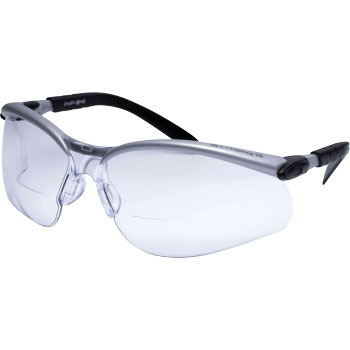 Safety glasses and lenses are not attached easily, so it is handy. I can see well, but the lens part is too small.